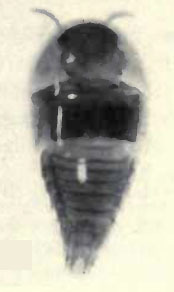 Termitohospes unicolor, from Seevers (1957). The Termitohospitina is a South American group of limuloid staphylinid beetles, found in association with termites of the Nasutitermitinae (Seevers 1957). Characters (from Seevers 1957): Body-form limuloid. Head strongly deflexed; concealed by large, shield-like pronotum except in Paratermitosocius (in which small part of vertex is visible). Pronotum with anterior and lateral margins continuously arcuate; surface not impressed. Anterior margin of submentum straight or slightly arcuate but not emarginate; anterior angles of mentum produced, apex of mentum emarginate. Abdomen slender, acuminate. Ninth tergite bifid, otherwise unmodified.